I am fan of Apple. Apart from work laptop, all of my home computers run Apple operating system. When Apple TV was announced I ordered one immediately. That was a year ago. What is my verdict after an extensive use? I like Apple TV design; it is small, sleek and quiet. The interface quality is best I have seen. The remote application on iOS devices is exceptionally good. AppleTV support playing slideshows of photos stored on other computers participating in the same Home Sharing network. That is all ok, if you want to play all photos in a project or album. For example, when I import photos, I label those that I would like to share. Clearly, there is no need to share all those 400 photos and make my friends suffer by "Death by Photos". 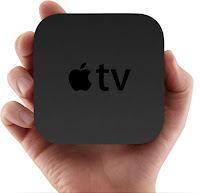 This is one of the biggest limitations of AppleTV. Its integration with Aperture 3 is very limited. It would help if I could set it to show photos with a specific label only. The integration with photo-hosting services, such as Flick, Picasa is also very basic or missing. I use QNAP TS-259 Pro as a home NAS. All my music, video files and photos are stored there. AppleTV 2 cannot access any of the content services provided by QNAP. And the list os rather extensive: SMB, AFP2, and DLNA. If I want to pay any movie I have to switch my iMac on and start iTunes. Hardly a seamless experience if you ask me! Why Apple does not implement DLNA, a standard for content management and playback? The Internet based services ar rather limited on this side of the pond. No Netflix, no Lovefilm and no Internet radios. I do not miss the last one as we have another Internet radio from Pure. So here you have it. Three most annoying issues with Apple TV 2 for me. The most fo them would be solved by implementing DLNA protocol and movie subscription services, like Netflix and Lovefilm. It cannot be that difficult as there are DLNA application in AppStore already! i think netffix is now supported, for everything else i would agree either implement dlna (but i don't think it will ever happen) or finally introduce apps for apple tv which would simply allow us to buy love film and good player. the alternative is to jailbreak and install xbmc i haven't tried that yet, but will.